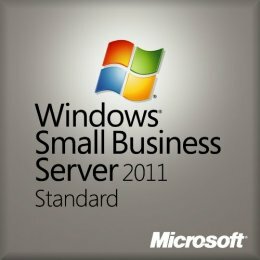 Microsoft Small Business Server 2011 Standard OEM x64 is the right server for small businesses that need a complete, on-premise solution with enterprise-class Windows server technologies for communication and collaboration. Designed and priced especially for small businesses with up to 75 users, Windows Small Business Server 2011 Standard (SBS 2011 Standard) is a complete solution designed for customers who want enterprise-class technologies in an affordable, all-in-one suite. Built on Windows Server 2008 R2, SBS 2011 Standard includes Microsoft Exchange Server 2010 SP1, Microsoft SharePoint Foundation 2010, and Windows Software Update Services. SBS 2011 Standard is a great opportunity for small businesses with prior versions of Windows SBS to upgrade their servers and to simultaneously take advantage of the advancements in security, reliability, and connectivity technology. To make it easier to upgrade from prior versions, SBS 2011 Standard software includes enhanced migration tools, extensive pre-migration checks, and prescriptive guidance.